Abstract. Marine sediment records reveal an abrupt and strong increase in dust deposition in the North Atlantic at the end of the African Humid Period about 4.9 to 5.5ka ago. 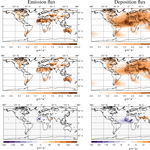 The change in dust flux has been attributed to varying Saharan land surface cover. Alternatively, the enhanced dust accumulation is linked to enhanced surface winds and a consequent intensification of coastal upwelling. Here we demonstrate for the first time the direct link between dust accumulation in marine cores and changes in Saharan land surface. 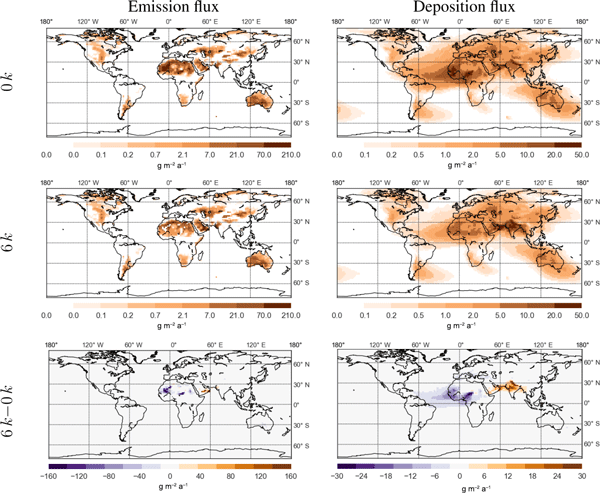 We simulate the mid-Holocene (6ka BP) and pre-industrial (1850 AD) dust cycle as a function of Saharan land surface cover and atmosphere-ocean conditions using the coupled atmosphere–aerosol model ECHAM6.1-HAM2.1. Mid-Holocene surface characteristics, including vegetation cover and lake surface area, are derived from proxy data and simulations. In agreement with data from marine sediment cores, our simulations show that mid-Holocene dust deposition fluxes in the North Atlantic were two to three times lower compared with pre-industrial fluxes. We identify Saharan land surface characteristics to be the main control on dust transport from North Africa to the North Atlantic. We conclude that the increase in dust accumulation in marine cores is directly linked to a transition of the Saharan landscape during the Holocene and not due to changes in atmospheric or ocean conditions alone. How to cite: Egerer, S., Claussen, M., Reick, C., and Stanelle, T.: The link between marine sediment records and changes in Holocene Saharan landscape: simulating the dust cycle, Clim. Past, 12, 1009-1027, https://doi.org/10.5194/cp-12-1009-2016, 2016. We demonstrate for the first time the direct link between dust accumulation in marine sediment cores and Saharan land surface by simulating the mid-Holocene and pre-industrial dust cycle as a function of Saharan land surface cover and atmosphere-ocean conditions using the coupled atmosphere-aerosol model ECHAM6-HAM2.1. Mid-Holocene surface characteristics, including vegetation cover and lake surface area, are derived from proxy data and simulations.